Presently in CPDCL during 2013-14, the HVDS project implementation agreements are being finalized in December 2013 and works are just grounded. Present HVDS project is being implemented with funds from JICA (Japan International Cooperation Agency). Survey of the existing 11KV agriculture feeder proposed for conversion to HVDS, mapping the 100/63KVA DTRs, mapping of associated LT lines, agriculture service connections details etc., Preparation of existing lines sketches, proposed sketches for HVDS conversion indicating mother DTR (higher capacity) and proposed DTRs (small capacity) & services. Conversion of existing LT system in to 11KV system by replacing LT X-arms, insulators etc., with 11KV X-arms, insulators using the same 34 Sqmm conductor. Worn out conductor will be replaced with new 34 Sqmm AAAC conductor. Erecting intermediate new poles where ever existing span is loose. Erecting 25KVA DTR on 9.1M PSCC pole on 75×40 mm channel support (pole mounted DTR) and erecting 3 x 1 Core XLPE 50 Sqmm cable for phase & 1 No. 25 Sqmm XLPE cable for neutral for LT.
Providing DTR earthing with 2 Nos 50 mm diameter CI Pipe of 2 meter length with 25 x 3 mm GI earth strip. Erecting 11KV & LT HG fuse sets. Extending service connections to three consumers with 3 x 16 + 25 Sqmm LT AB cable from DTR up to agriculture bore well. A 25KVA DTR can be loaded maximum upto of its capacity. Erecting of single phase LT -/5A electronic meter with meter box with 50/5A CT.
Painting the structure code and service numbers on the pole. And also painting pole numbers on poles on black background with white letters. Devolution of 100/63KVA mother DTRs, removed LT hardware etc., to stores. Reduction in line losses since HV line is taken almost up to consumer load point and on LV side AB cable is used. Failure of agriculture DTRs are minimized as LT overhead line is avoided and also load per DTR is restricted. Hence, no failure on account of over load and LT faults. Reduction of unauthorized agriculture connections, as one small capacity (25KVA) DTR is erected for two or three agriculture consumers. 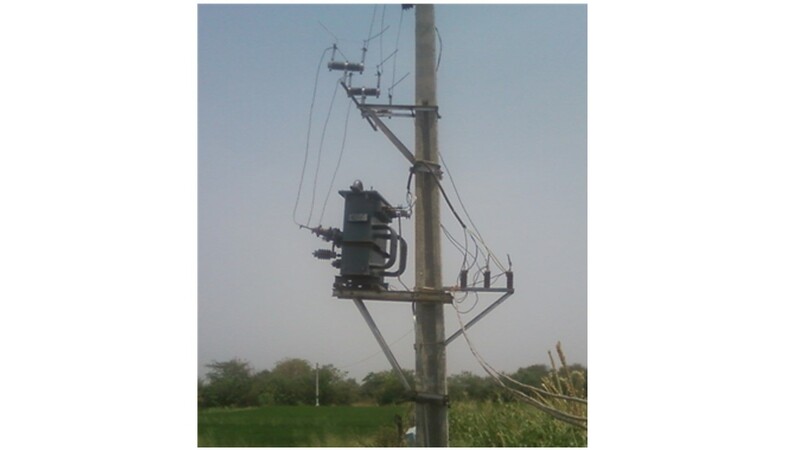 The agriculture consumers will have a feeling of ownership of transformer due to limited connections on it. As 11KV line is taken almost to the load point, improvement in voltage profile near agriculture pump sets is observed resulting in good performance of motor. Pilferage of electricity is completely avoided as LT AB cable is used from DTR LV up to consumer bore well. Pole mounted 25KVA HVDS DTR structure is as follows…. This HVD System was started earlier on around 2002-03, but, with single phase 10 kva & 15 kva DTRs, which were connected in delta from outside. This system is even more successful with 25 kva three phase DTRs, as you rightly said. The main advantage with this system was, we could bifurcate the town and rural feeders, thus avoiding agriculture loads on town feeders which are non-metered. Also the DTR failures could be avoided to a large extent.